I really don't want to bore you with a sales pitch as to how we have been achieving this recognition (hopefully you have your own ideas, and if you were one of the nice people who voted for us, I thank you personally - and owe you a drink). All I will say is "thank you" to the HfS team for working their socks off and making this all possible. And also a thank you to YOU for reading our stuff, saying great things about us and believing in our approach and determination to change the face of the analyst industry forever. I would also like to thank the hard-working people at Kea Company, which today has adopted the mantle of "analyst of the analysts" for pulling off such a terrific and comprehensive study. If you would like to purchase a full copy of the results, you can access them here. If you are a provider marketer who needs some conclusive data and a decent steer where to invest your analyst relationship time, you could to a lot worse than spend some time with these guys. Amazing achievement Phil and team - and well deserved! You must be very proud. This is testament to the excellent research HFS produces. Super news, HfS team! Really shows how well you have all done! Congratulations HFS. Show the world what you have to offer! HfS Research did an amazing job, again, this year. Just keep in mind that 1100 people do not lie and it becomes time to look at more than just the traditional "1.0" firms. It is clear that this is the age of the "2.0" research firms! Congratulations Phil & HfS Team. Well deserved testaments. Kudos! Almost as exciting as winning the Ryder Cup. Congrats to the HfS team! Well done HfS - you should be very proud of this achievement! Phil and team - this shows increasing momentum from HfS over a long period now. You have arrived! Nice job! You must be very proud. Congratulations Phil and entire HfS team. You are breaking molds in the outsourcing and shared services industry, and the world is clearly recognizing you for that! Congratulations again!! Many congrats to Phil and his team. I've been following you since long before you set up this firm and am truly impressed by how quickly HfS has risen to prominence in the industry. You have achieved in a few short years what takes most other firms a couple of decades. Great achievement by the HFS team! Hearty Congrats and well done. As the researcher who led this survey, I do wonder what else the results mean. 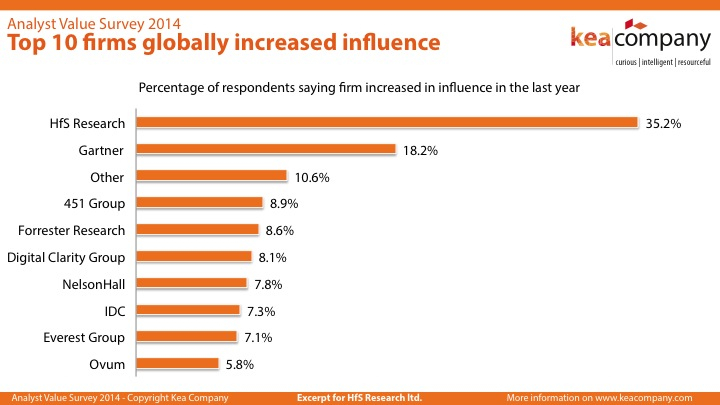 I think it's quite appropriate to see the results of this questions as an impressive accomplishment for any firm, but especially for HfS Research which has won a reach far greater than its modest size should allow. 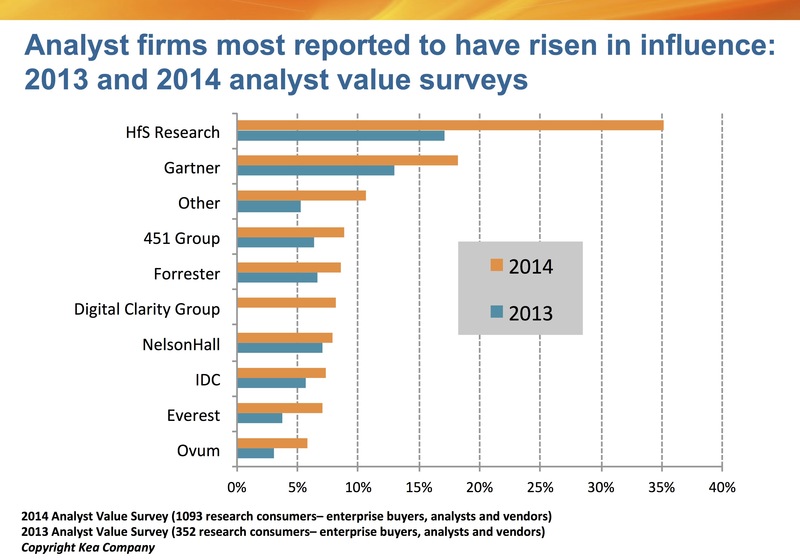 That said, I also wonder if this doesn't also show a degree of under-innovation in the rest of the analyst industry. 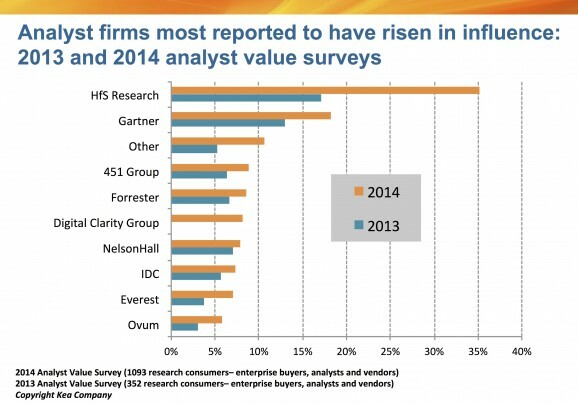 There's really only Gartner that seem to have hunger to really grow very fast. I should also note two other things about the survey. First, this wasn't the only question. HfS came top on this question but not on all the others. There isn't one clear "winner" from the survey. Second, the survey isn't a survey only of buyers but of users generally (some of whom buyers, others influence buying, and some don't influence buying at all). So, well done to the team at HfS -- and let's see if their competition can do better next year. Many congratulations - well deserved recognition! Phil and HFS team - it's amazing to see the impact a small company like yours is having on the industry. I can't praise you guys enough for the quality and insight you provide - you do us all a great service and deserve all the recognition you are getting. Thanks David - that means a lot!